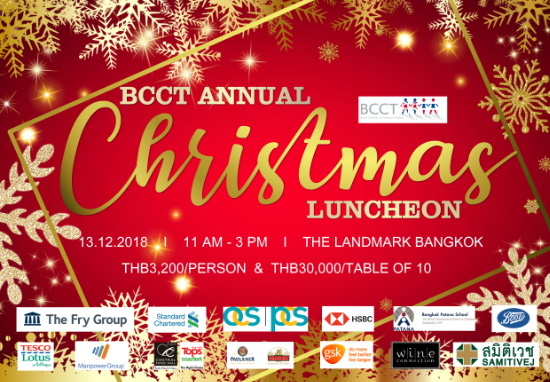 The Lunch is the highlight of BCCT’s annual events calendar and is the best-attended event of the year with 600 members and friends joining. Members use this event to thank and host their clients and staff. There will be on-stage entertainment and a special festive 3-course menu will be served along with free-flow British beer, wine and other beverages. Spectacular raffle and door prizes have been generously donated by members and non-members. Cost: THB3,200 per person or THB30,000 for a table of 10 with payment received on or before noon of Wednesday 12th December. Payment Methods: Please click HERE. Once completed, please e-mail chonticha@bccthai.com your pay-in slip to verify. Tickets and a receipt can be collected at BCCT office after payment from 9am - 5pm Monday to Friday at BCCT Office, 7th fl., 208 Building, Wireless Road. The position and price of your table in the ballroom is determined by when payment is received. Huntsman Pub offers a special happy price from 3 pm to 8 pm. House wines and beers are sold at THB 150/glass. The BCCT takes the security threat very seriously. PCS security staffs will inspect the venue along with The Landmark security team prior to the lunch. In addition, security guards will be present in the registration area to ensure that the following procedures are followed. Members are asked to co-operate fully with security personnel and BCCT staff in this regard. 1. Strictly no admittance without tickets. Tickets must be purchased and collected from the BCCT office by 5pm on Tuesday 11 December. The BCCT office will be closed on the morning of Thursday 13 December. All walk-ins will be turned away. 2. Tickets must be shown by all attending to gain entry to the ballroom area. No ticket, no entry. For those with table bookings, tickets should be given to each guest before entering the registration area. 3. Please do not bring any briefcases, laptops or other large bags. You will be asked to deposit these with the hotel concierge before entering the registration area. 4. Security personnel may undertake any searches as appropriate. Please co-operate fully with security personnel. Given security concerns, the BCCT asks for your full co-operation with regard to these measures and hopes that they will not cause you any inconvenience.